Last month, the National Autonomous University of Mexico (UNAM) and CSF presented the second annual Economic Tools for Conservation in Mexico and the Mesoamerican Reef. Twenty participants from different regions of Mexico and the Mesoamerican Reef came together to learn what economic drivers cause environmental problems and the potential solutions to them. 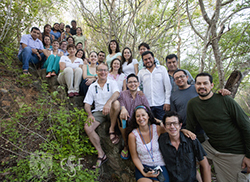 The two-week course was held June 15th-26th at UNAM’s Chamela Biological Station in Jalisco, Mexico. Instructors from UNAM, Mexico’s Iberoamericana University, and CSF facilitated the course, which covered microeconomics, natural resource economics, payments for ecosystem services, economic values and cost-benefit analysis. Participants were able to learn the tools needed to apply these newly acquired skills to issues in their day-to-day work. “Recibí los instrumentos económicos de evaluación necesarios, que le faltan a los estudios de Capacidad de Carga; pienso demostrar con valores económicos, los beneficios a largo plazo de establecer cuotas límites en el uso de recursos naturales en Áreas Naturales Protegidas”. Thank you very much to our partners in the initiative: UNAM-CSF, the Institute of Ecology at UNAM, GIZ/CONANP, Environmental Defense Fund (EDF) – Mexico, MARFUND, Mexican Fund for Conservation (FMCN) and FONNOR AC, and The Nature Conservancy (TNC). Also a special thanks to our partner and promoters: CSF Alums Eduardo Ponce, Eglé Flores, Angelica Mojica, and Laura Rodriguez, who have been promoting this initiative for three years now. To all of them, thank you for your collaboration!